Is Gaddafi Still Dispensing Largesse From the Grave? 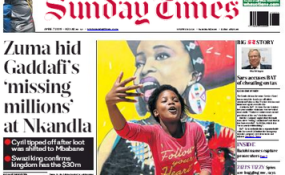 The Sunday Times reported that Libyan military authorities asked President Cyril Ramaphosa to help recover an estimated R442m which belonged to Gaddafi and which was believed to be in eSwatini. Minister of International Relations and Cooperation Lindiwe Sisulu says her department will probe allegations that late Libyan dictator Muammar Gaddafi's loot of millions made its way from Nkandla's bunker to Eswatini - if the Libyan government wants it to do so.